Can't remember what types of soap are safe to use for CPAP mask cleaning? Want an easier way to clean a CPAP mask? 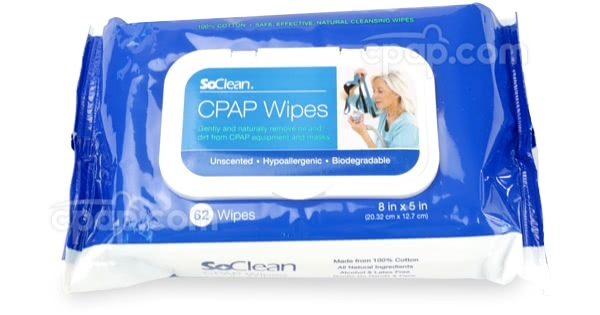 SoClean, a popular brand among CPAP users, has a line of mask wipes that are 100% cotton and fully unscented, hypoallergenic, and biodegradable. SoClean Mask Wipes are designed to make cleaning easy and be gentle on the hands and skin. 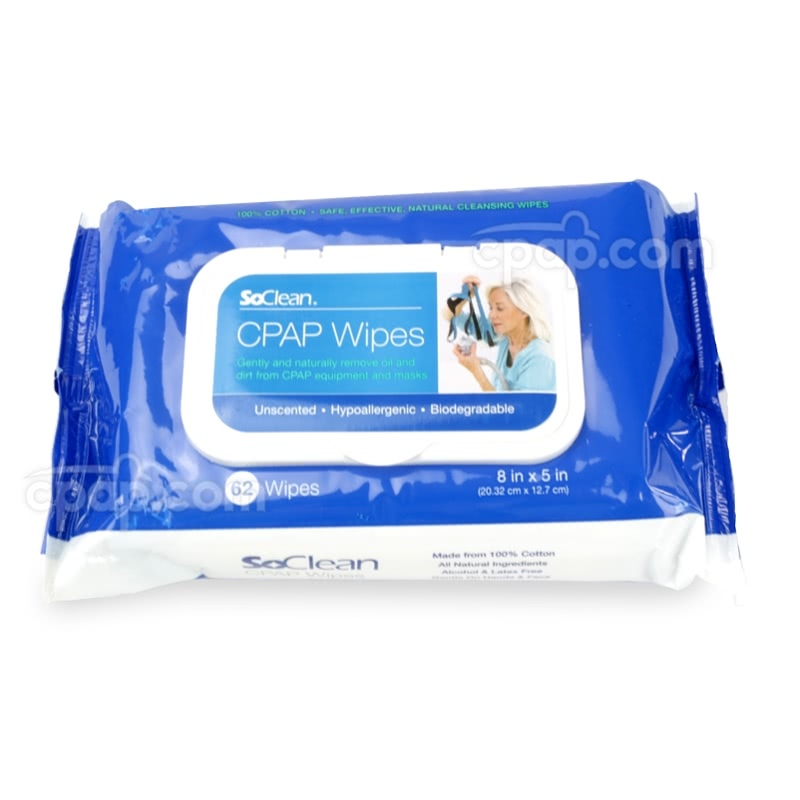 The wipes won't damage a CPAP mask or CPAP equipment and don't leave a smell or residue. It is a safe alternative to household cleaners for cleaning CPAP masks. When it comes to cleaning a CPAP mask, it's important to know not to use household sprays and cleaners. These products are unsafe to use because they can potentially leave a residue that can make the therapy air harmful to breathe. This is where SoClean Mask Wipes come in. The wipes come in packs of 62 wipes and are 100% cotton, as well as being gentle on the hands and skin, with no harsh chemicals. The wipes are made with cotton and have no synthetics as a part of the design. The cotton design is beneficial for avoiding certain types of allergies. The cotton wipes are also gentle on the hands and skin and provide a durable surface to remove the most difficult residue. The wipes are 100% biodegradable, meaning over time, they can break down easily and generally have a better impact on the environment. When a product is hypoallergenic, it means that it's not likely to cause an allergic reaction. The wipes are designed to be safe for people with allergies and use no harsh chemicals. Each package of wipes comes with 62 wipes, making it an essential tool in any cleaning routine. Most people would use a single wipe to clean a mask, meaning that at most the SoClean Mask Wipes could be used for 62 separate mask cleanings. With no harsh chemicals, the wipes are easy on hands and skin. The wipes are also scent-free, and won't impact the quality of the therapy air received during treatment. 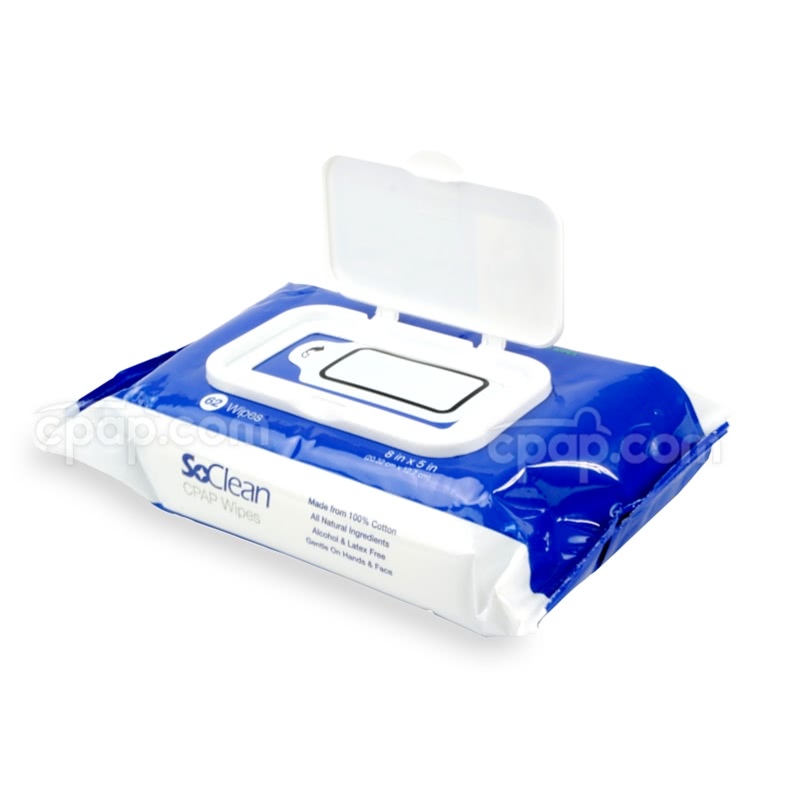 SoClean Mask Wipes are designed to remove residue and clean the toughest parts of a mask. They also disinfect, killing germs and sanitizing the area. They help get rid of smells, residue, and debris quickly and easily for perhaps a more pleasant sleeping experience. PLEASE NOTE: It's important to never use household cleaners when washing a mask, humidifier or other CPAP equipment. Household cleaners contain many harsh chemicals that can turn therapy air toxic. Harsh chemicals such as bleach can also damage hands and skin. 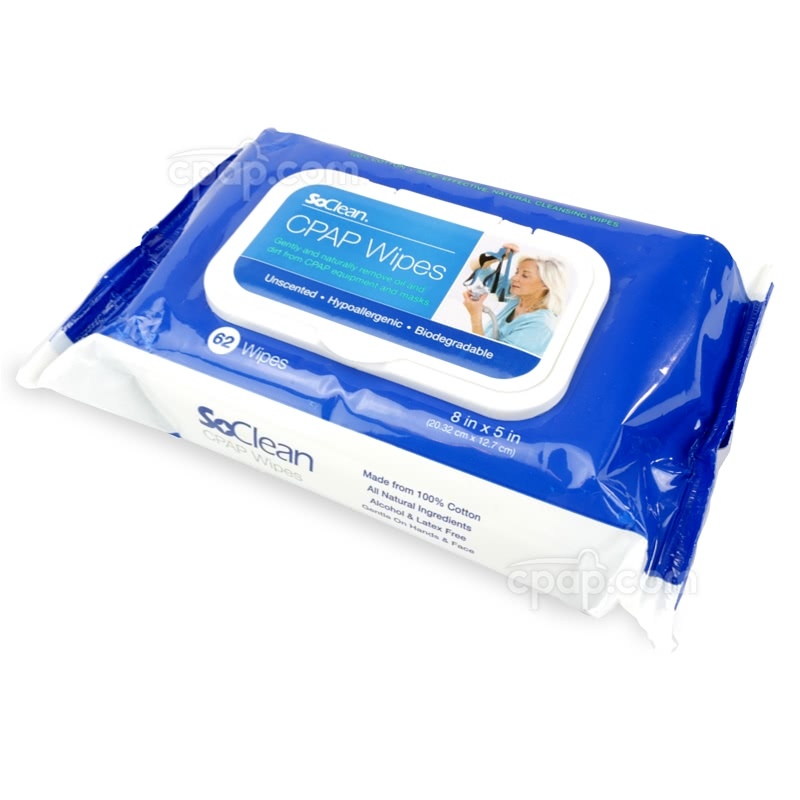 SoClean Mask Wipes are safe to use when cleaning a mask, as they contain no harsh chemicals. They are hypoallergenic and are not known to trigger an allergic reaction. Store in a cool, dry, place. Do not store the wipes in hot temperatures. High heat can cause the wipes to dry out and lose potency. Do not store below freezing, as wipes can freeze.